Writing about a film such as this is a somewhat challenging endeavor, as it’s essentially impossible to discuss without ruining the central joke. Needless to say, we promise that the protagonist’s request from his Dad isn’t what you’re expecting—it’s as filthy as it is darkly hilarious. Nothing visually on-screen is NSFW, but like Clerks proved way back in the aughts, sometimes all it takes is dirty dialogue to get that R-rating. 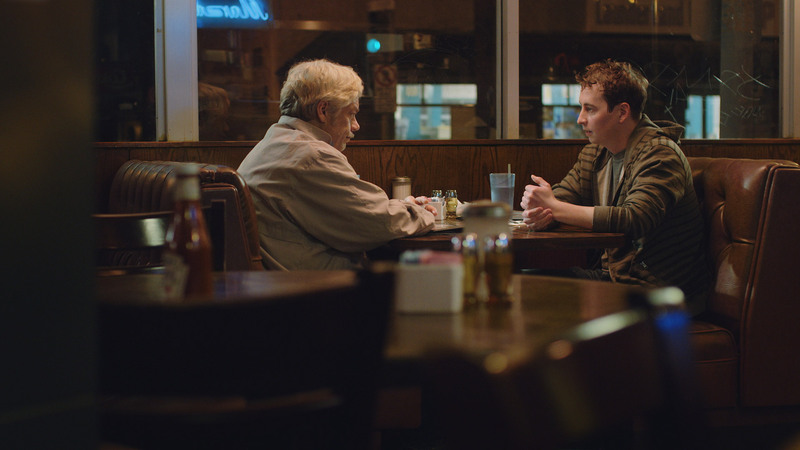 You might not “see” anything, but the film incites mental visuals that you can’t “un-see.” For a short that only features two guys talking in a diner, it really does stick with you. What separates this film from a comedy sketch? To be honest, not much. But, there is depth here. Although the film is essentially just a conversation that escalates with a terrifying sense of comedic absurdity, as it goes on, we gain some perspective on larger subjects. For one, there’s this idea of one’s dignity as a product. It’s a concept that has been addressed before—from reality television to last year’s indie feature Cheap Thrills. But, here it works in microcosm—a simple extrapolation of the old “would you do ‘blank’ for a million dollars?” game we’ve all been playing since elementary school. The premise is oddly relatable, no matter how horrific it may seem. We all have a monetary breaking point, right? The film is simply shot, but looks fantastic (kudos to cinematographer Scott Uhlfelder). And, the two protagonists—John Ennis (Mr. Show, Arrested Development) as the Dad and Stephen Ellis (Hail Caesar!, Delivery Man) as the son—are both expert comedic performers. Comedy is as much in the timing and delivery as it is in the dialogue itself and both actors nail it here. Andrew Laurich is currently working on more short film projects with his co-writer Gabriel Miller. Hopefully, they will be just as demented as A Reasonable Request. To keep up date, be sure to check out his website.